I know lots of you are packing up the kids and heading over the river and through the woods to grandma's. When you get there or while you're on the way take a listen to this. Grandmas and grandpas out there it would be a good idea for you lot to take a listen too. Here's to a harmonious family Christmas. Love. Compatibility. Money. Attraction. These are what lovers consider when they decide to tie the knot. In-laws are usually the last thing on their minds. Yet, dealing with your significant other's family can be an everlasting quest…and it can be a factor that helps determine the duration of the marriage. British psychologist Terri Apter has found herself scrambling to deal with some of the very situations she counsels others about. She talks with host Mike Cuthbert about how she maintains a healthy relationship with her in-laws, and what she suggests to others. She’s conducted a study on various in-law relationships, and she collects stories about them– some of which she shares at a Web site, and many of which she has compiled in her latest book "What Do You Want From Me? : Learning to Get Along with In-Laws." Flowers blooming in the garden. I've been doing research into autism, dyspraxia, how the normal brain works, and how an autistic/dyspraxic brain works (or doesn't work). Traumatic injury to different parts of the brain can cause the same problems suffered by autistic and dyspraxic children. Compare this list of the functions of different parts of the brain and the problems caused by injuries to those areas with these descriptions of dyspraxia and autism. Some random dude on Facebook posted this dreck. "For those of you who take adderall & swear you aren't a meth head." Alongside a photo of models of the molecular structure of crystal meth and the active ingredient in Adderall. A concerned Facebook friend wanted to know if it was true. #nerdspawn to the rescue. "The two drugs do have similar chemical structures. 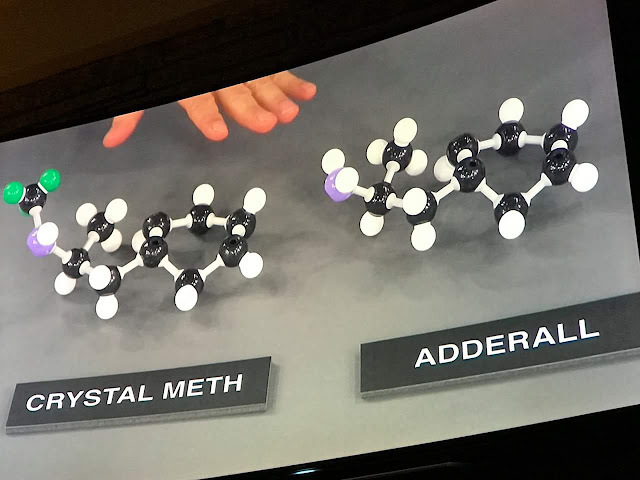 However, therapeutic doses of Adderall taken under supervision of a medical professional are no comparison to drug addicts abusing crystal meth. Whoever did this needed to spend more time on their organic chemistry and molecular neuropharmacology. People shouldn't try to equate taking Adderall as prescribed with abusing crystal meth. We need less of this kind of foolishness stigmatizing people and preventing them from getting the help they need." Any questions?